1. Pre-heat the oven to 350 degrees Fahrenheit. 2. Cut the lemon zest into very thin strips (1 inch long) and cut the chive into 1 inch long pieces. 3. Heat the olive oil in a medium sautoir over medium-high heat until hot. 4. Wipe the osso bucco dry and season with salt and pepper. 5. Sear the osso bucco on both sides until golden brown. 6. Meanwhile, cut the onion, fennel, carrot and celery into ¾ inch squares. 7. Remove the osso bucco from the pan and set aside. 8. Turn down to medium heat and add the onion, fennel, carrot and celery. The moisture released from these vegetables should be enough to deglaze the fond. If not, add a tablespoon of water and clean the bottom of the pan. 9. Once the vegetables have browned slightly, add the cumin, then add the crushed tomato and cook over medium heat until the liquid is gone. 10. Add the wine and evaporate until most of the liquid is gone. 11. Add the paprika and dried chili. Add enough veal stock to cover ¾ of the osso bucco. Once you add the bay leaf and thyme, put a tight lid (plastic wrap that can withstand the heat, then foil, if there is no lid for the sautoir) on and place in the oven. 12. 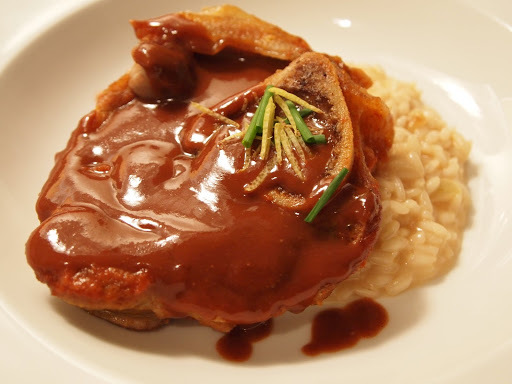 Braise the osso bucco until fork tender for an hour and a half. 13. When the osso bucco is done, remove the meat and set aside (keep it covered and warm). 14. Put the braising liquid through a chinois or sieve and into a small sauce pot. 15. Add the shaved chocolate and honey and mix well. Taste and season with salt and pepper if needed. Adjust the consistency by adding a slurry of corn starch and water (should be the consistency of heavy cream). The sauce should be medium nappe (leave a fairly thick coat behind a wooden spoon). 16. Meanwhile, start the risotto. Keep the veal stock hot (add salt but do not season fully because the cheese will add some salt to the risotto). 17. Heat the olive oil and add the shallots. Slowly caramelize over low heat. When tender, add the rice and cover each grain with the oil. 18. Add enough stock to cover the rice and stir while cooking. 19. When the rice has absorbed most of the stock, repeat step 17 by adding more stock. 20. Keep stirring the rice and keep adding more stock until the rice grains are al dente (have a bite) and the risotto flows (not too thick not too watery). 21. Add the taleggio and parmigiano reggiano and season with salt if needed. 22. 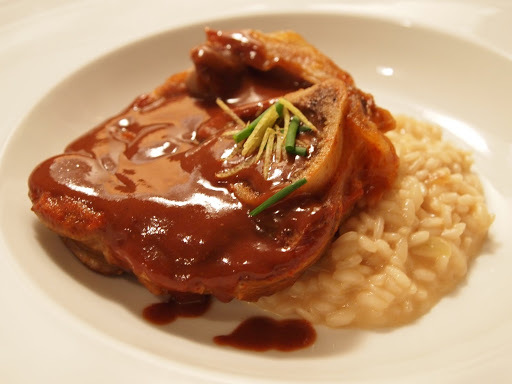 Place the risotto in a bowl dish and lean the osso bucco over the side. Cover the osso bucco with the sauce and garnish the top of the marrow with the lemon zest and chives.